Today is National Ugly Christmas Sweater Day (no, I don’t know who came up with this either, but it’s a thing, so let’s just go with it). I do not own an ugly Christmas sweater. I am, in fact, not entirely sure I have ever owned one (no, friends and family, that is NOT a go-ahead to get me one). But a few months ago, I knit one. I may or may not have mentioned that occasionally I do test knitting for various designers and yarn stores and companies. I usually can’t really say much about them beyond fairly generic ‘I am knitting on a thing’ comments, and it is rare that I get to share pictures of them with the general public. But in honor of it being National Ugly Christmas Sweater Day, I am going to share one of my most recent test knits. Yes, I made one of the sweaters for this collection. The sweater itself is a basic crew neck. The pattern was then double-knit onto it, which was only difficult because my particular sweater was done in black and so the individual stitches were next to impossible to see. Each of the other sweaters in the collection has similar construction, although some have more complicated bits and pieces (the reindeer comes immediately to mind – those antlers crack me up). 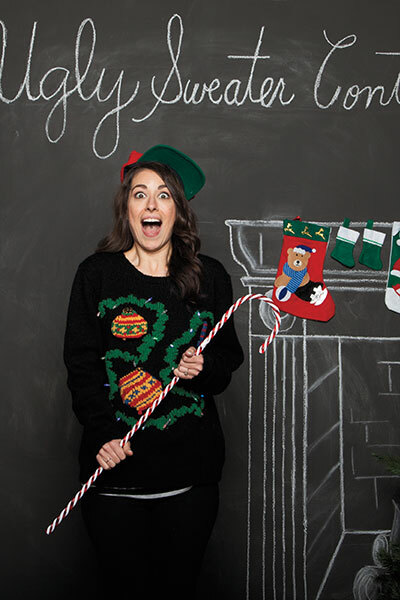 And now I am pondering knitting myself my very own Ugly Christmas Sweater. I would wear that snowman one in a heartbeat, any day of winter, because I think it’s actually kind of adorable. And the elf one is really calling my name (although that one definitely has a more narrow window of use). I’m not sure if it’s because of the stripy sleeves, or the crazy i-cord legs and arms, but I’ve kind of fallen hard for it. 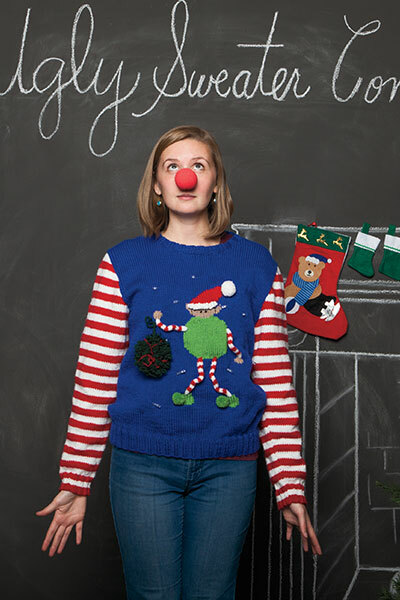 So maybe next year, on National Ugly Christmas Sweater Day, I will have my very own sweater to model. In the meantime, though, you’ll just have to be content with a picture of a sweater I made, on someone else. ‘Tis the season for Holidailies. DO IT! DO IT! 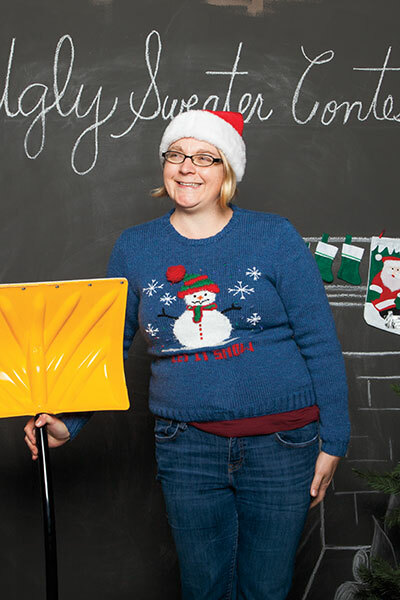 It’s delightful to have made an ugly sweater, and be working on #2 and pondering what to do for #3 and #4….